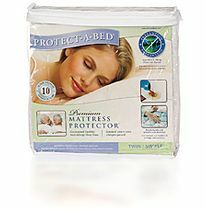 Protect-A-Bed® Premium mattress protector is under warranty for 10 years against fabric and manufacturing defects. When mattress cover is sold and delivered with a mattress from an authorized Protect-A-Bed® dealer, a spillage warranty is also provided. NOTE: Mattress protectors are considered a personal item and are not returnable and do not have a 30 day satisfaction guarantee.